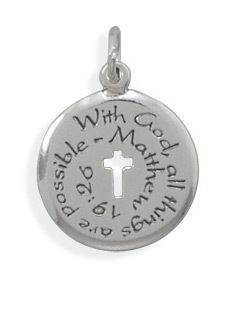 A cut-out cross is at the center of this piece, but the focal point of this unique Christian medallion cross necklace is the Word of God in sterling silver. "But Jesus beheld them, and said unto them, With men this is impossible; but with God all things are possible" (Matthew 19:26). What did Jesus mean by these words? That all can be saved who call upon the name of the Lord Jesus Christ for their salvation; and that by faith nothing shall be impossible unto men when they are working according to the will of God. Cross medallion measures 20mm in size (just over 3/4"). Add a matching sterling silver box chain necklace (optional). Every Christian jewelry from Apples of Gold jewelry comes with free shipping and our 45-day return policy. Have any questions about our jewelry or service? Contact us at anytime and learn more about Apples of Gold Jewelry. We guarantee our Matthew 19:26 Christian Cross Medallion Necklace in Sterling Silver to be high quality, authentic jewelry, as described above.